In the off-wedding season, I do Christmas decorating for homes and businesses. I create a theme, then work with your existing decorations, set up trees, and add whatever I can within your budget. I also plan holiday parties for families, non-profits, and businesses. 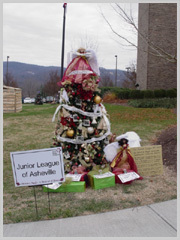 "Eleanor Campbell was a part of the winning Junior League of Asheville team in Park Ridge Hospital's Holiday Magic: A Festival of Trees event in 2007 and 2008. She has been a member of the Asheville Holiday Parade committee since 2000. And she regularly creates holiday displays as part of her job in the store. You might call her Mrs. Claus!" Proffitt's Store Manager, in 2004. 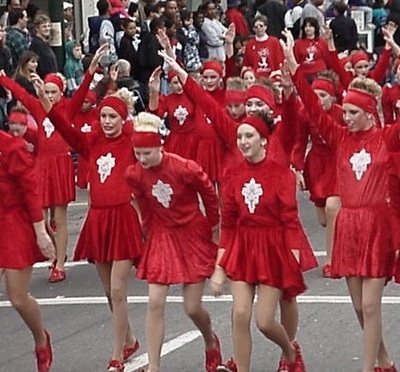 Click below to watch an episode of the UNC-TV (PBS) program Our State that features the Asheville Holiday parade Eleanor Campbell organized in 2005. The parade has over 100 entries, 25,000+ spectators, and requires coordinating police, fire, emergency and street services as well as street vendors, VIP's, media, and 1,000 participants of all ages. 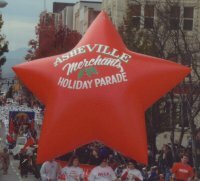 Ms. Campbell coordinated the parade for the last three years that it was run by a non profit called Asheville Merchants Corporation. Today, the parade is handled by the Asheville Downtown Association, and she is a key volunteer.